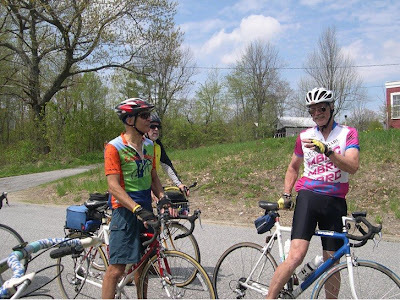 Last Saturday's KVBC ride in Hallowell saw us explore an entirely new route that began with a tour through the back streets of Hallowell itself. Most visitors to Hallowell (well, myself, anyway) don't often venture past the main drag along the river, so to ride past some of the hillside homes with their graceful architecture and landscaping was a welcome change. The town is hilly, though. Leaving Hallowell the ride headed west, touching on Farmingdale, Litchfield, and Gardiner. The route took advantage of scenic back roads that were relatively traffic-free (other than a short stretch on Rt. 126). A particularly nice stretch passed along the shores of Sandy Pond and Woodbury Pond in Litchfield. 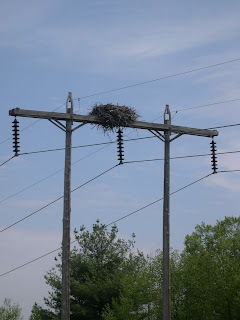 At one point we stopped to admire another example of local architecture - an impressive nest perched on a crossbar of some high-tension power lines. An ornithological discussion ensued as to whether this was an eagle's nest or an osprey's nest, with the edge going to the osprey. No resident made an appearance to clinch the matter. Apparently the occupants were unconcerned about electromagnetic radiation. We did marvel at their landing skills. At that point the discussion turned to food, and since we were close to George's house we were graciously offered a "cookie stop" for a batch of fresh oatmeal-raisin cookies, which were spot-on perfect and much appreciated. It was moved that "cookie stops" be made mandatory for all KVBC rides in the future and promptly seconded. I'm not sure if we had a quorum, but the measure passed by acclaim. 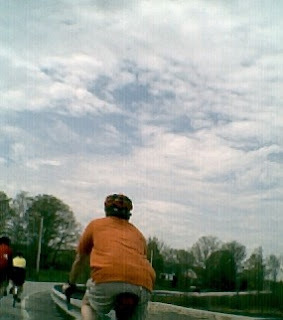 Many thanks to John for leading the ride, and to the Luckhursts for the impromptu "cookie stop." Next Saturday's ride is in Litchfield with George leading - more great riding and perhaps another "cookie stop" in store!